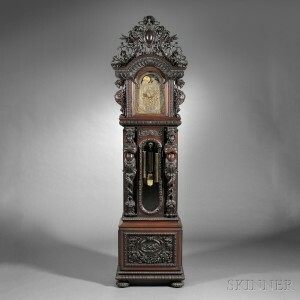 Clocks, Watches & Scientific Instruments Gallery Walk | Skinner Inc.
All are welcome to attend a free event at the Skinner Marlborough Gallery. Robert C. Cheney, Department Director, will present highlights from the November 1, 2014 auction of Clocks, Watches & Scientific Instruments featuring Historic Arms & Militaria. From enameled French mantel clocks to an impressive selection of tall clocks as well as antique and modern watches, the November auction offers something for everyone with an interest in horology. In addition, the auction features scientific instruments, antique vehicles, and a selection of historic arms & militaria. This entry was posted in Event and tagged american clocks, antique vehicles, antiques event, art event, Clocks, E Howard, Ferrari, Ford, free events in massachusetts, french clocks, grandfather clocks, historic arms, horology, Japanese clocks, long case clocks, Militaria, Robert Cheney, scientific instruments, tall clocks, telescopes, watches by Skinner. Bookmark the permalink.